Moth-munching, yarn-stash guardian extraordinaire. Cupboardy Monsters sole duty is to banish moths. He’s put to work at WoolnHook HQ as a yarn-stash guardian but he’d be equally welcome and proficient in cupboards and drawers around the house. It comes as an added bonus that he’s super handsome and snazzy. See his awesomeness on Instagram #cupboardymonster. 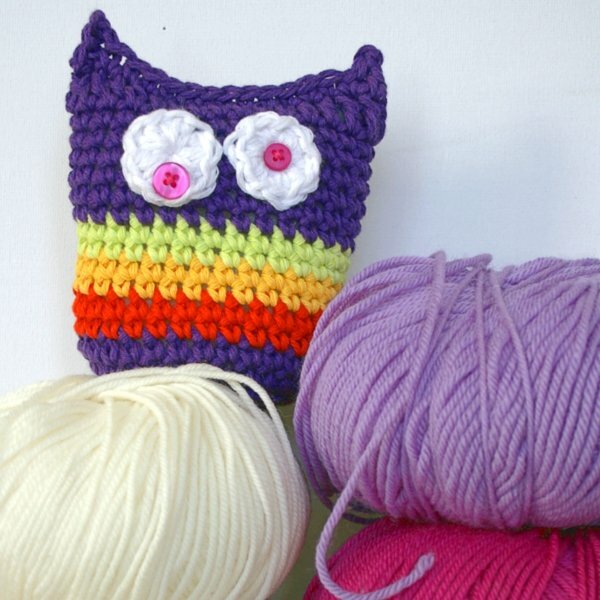 Now, you’re going to want to make your own Cupboardy Monster because he’s just so darn splendid and nobody wants moths wriggling around in the yarn stash. Big No No. sc = single crochet. 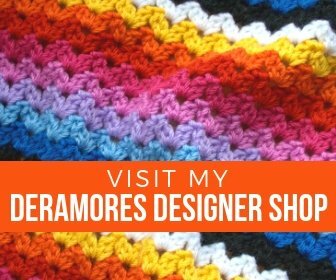 UK terms = dc – double crochet. [ ] = repeat instructions in brackets the stated number of times. 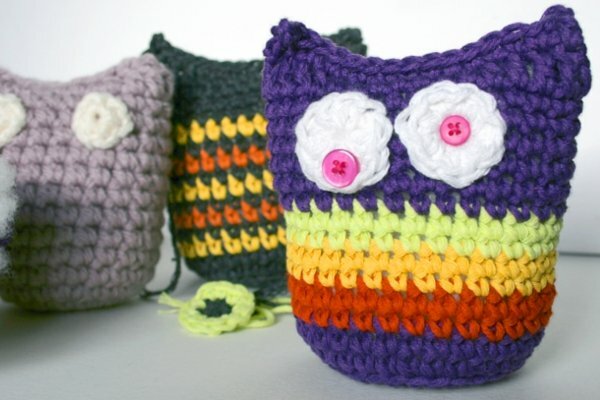 The pattern is in US crochet terminology. 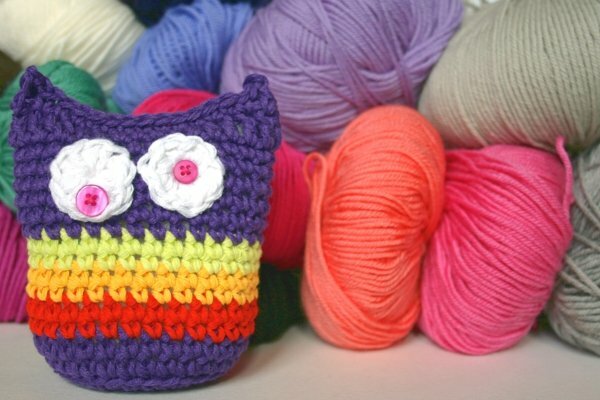 See above list for stitch conversions to UK crochet terminology. With Color A make a Magic Ring. Repeat round 7 changing to colour C at the end of the round 9. Repeat round 7 changing to color D at the end of the round 11. Repeat round 7 changing to color A at the end of round 13. Repeat round 7, do not end color A.
ch 1, [1 sc in 4 sts, 1 hdc in 2 sts, 1 dc in 4 sts, 1 hdc in 2 sts, 1 sc in 3 sts] twice, join to first sc made. 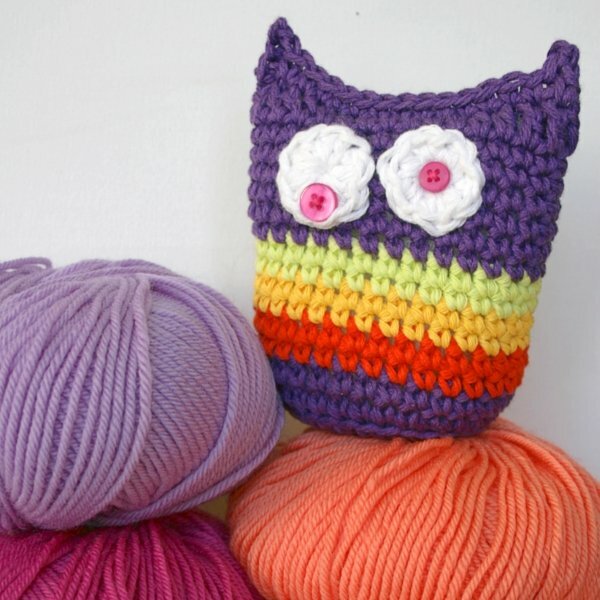 End Color A.
Sew in all the yarn ends neatly. Create some Eyes for Cupboardy Monster: Make 2 (or one, or three. Its up to you how many eyes your Cupboardy Monster needs). With White yarn, make a Magic Ring. ch 3 (counts as 1 dc), 11 dc into ring, join to 3rd of beginning ch3. End yarn. Sew eyes to the Cupboardy Monster and attach buttons for his pupils. I’ve used buttons of different sizes for my Cupboardy Monster because he’s a rather perplexed monster who is slightly dazed from the fumes emitting from his lavender heart. 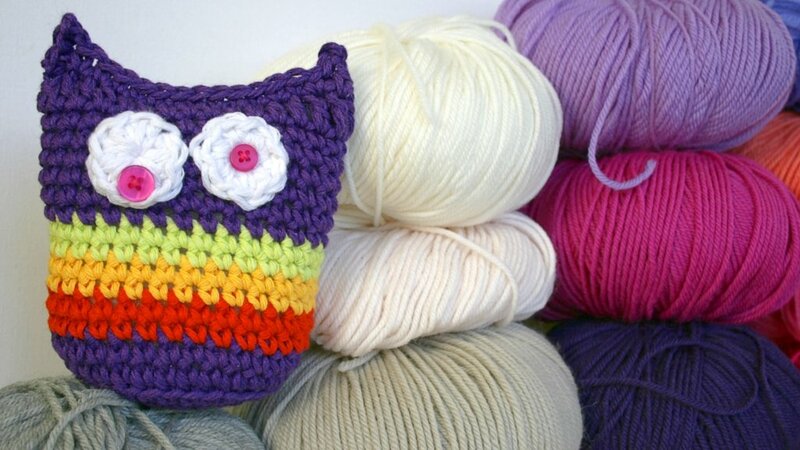 Cupboardy Monster requires a scented heart to banish foul moths from precious yarn stashes. Also required for loving. To make a suitable heart, grab some fabric scraps. Muslin or cotton works great, or, if you are a snazzy sewing star you can use organza for optimum scent release properties. Make two heart shaped pieces (round, square and wonky will work too) and start to sew together. You’re on your own with this one as sewing is not my Kung Fu. Before you seal his heart completely, sprinkle in a heady dose of dried lavender. Enough so his heart is bursting with scent. Next, stitch his heart closed. Now give Cupboardy Monster his lavender heart and fill around it with plenty of squishy stuffing. Fold the opening so that the front begins on the right-hand side with 2 dc, 2 hdc, 7 sc, 2 hdc, 2 dc. The back of Cupboardy Monster should match up. As you work this row squeeze in a bit more stuffing as you go along so that Cupboardy Monster is nicely padded. Join Color A in top of the first dc on the right-hand side and through the corresponding dc on the back, ch 1 and sc in same place, ch 3, sl st in 1st ch (picot – or rather, ear – made), 1 sc in each st to last but one st inserting the hook through front stitch and corresponding st at the back, ch 3, sl st in 1st ch (picot – other ear – made), 1 sc in last st. End Color A.
Sew in those pesky ends and welcome Cupboardy Monster to the world. 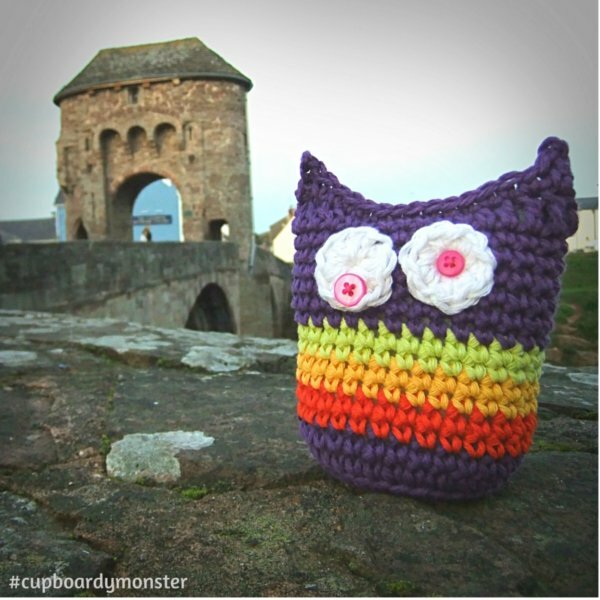 Take photos of splendid Cupboardy Monster and share on Facebook / Twitter / Instagram / Ravelry / Tumblr, etc. Link me in so I can see how fancy your Cupboardy Monster is. Then place him in a suitable moth-munching location. Whack Cupboardy Monster in the heart a few times with hammer. Picture bills and lawyers, tax men and irritating neighbours, or anything else that’s ticked you off recently. Whacking damages the dried lavender thereby releasing more splendid scent. Try to avoid his eyes as we wouldn’t want them to crack and shatter. Say you are very, very sorry to Cupboardy Monster. Sit back and watch him scent sweetly. My Cupboardy Monster is so super-duper that he is taken in suitcases when I go a-travelling. Follow Cupboardy Monsters adventures on my Instagram feed #cupboardymonster. What a splendid ‘monster’ he is, too! and a wonderful idea for a gift! Imagine spreading little monsters all about sharing with all you know – so they, too, can protect their precious woolies! I think I shall start my first one immediately – and see if maybe he won’t start “reproducing” and spreading his monster goodness all about! Oh yay! More Cupboardy Monsters are definitely needed in the world! I’m looking forward to seeing his awesome monster splendidness spreading far and wide.